I told my husband that this past September was as difficult for me as the final month of my first pregnancy which ended in an emergency cesarian and five days in the NIC unit. We were new to Anchorage at the time, and Walt had to leave to go back to work on a tugboat far away in the Prince William Sound for six weeks just hours after we brought our first son home. I had no support, and no idea what I was doing. But I survived. And I survived this September too. Or maybe I should compare it to the February when I had two solo shows. 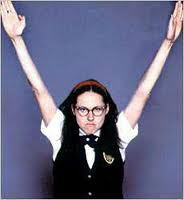 Molly Shannon always comes to mind when I think about that experience–it felt victorious, but looked ridiculous. You read can all about that adventure here. It is all about the deadline. I love deadlines because they push me to get things done, to produce new work, to make it all happen. I hate deadlines because I–in a kind of real way–am killing myself in the process. 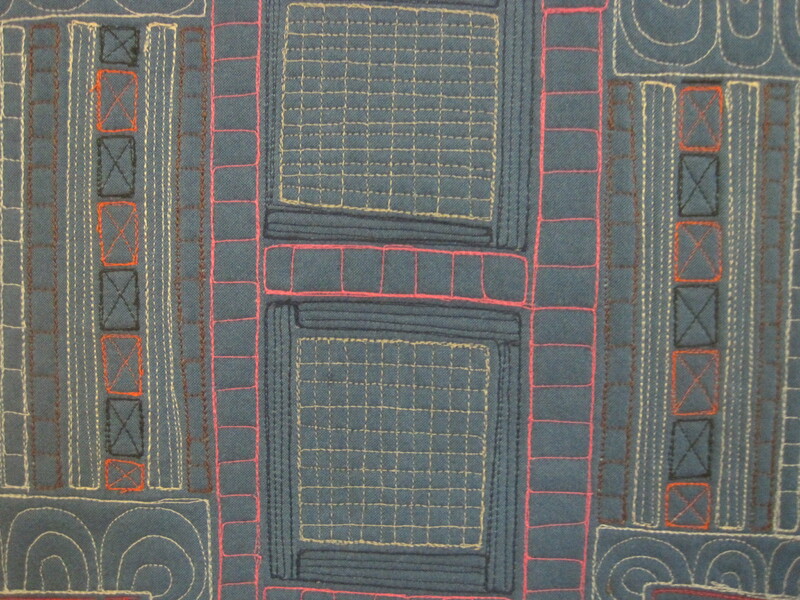 My elbows are inflamed from the quilting. My hands are claws from the handwork. My left eye twitches and twitches from the hours of concentration, from focused starting, from following the line of stitch for hours upon hours. My body is falling apart to produce the work I love. Part of me is ashamed that I cannot properly pace myself. And part of me feels like quite the cry baby for even mentioning it. WAH. You had to produce work for a solo show. I need to do a better job of pacing myself. This is true. And I need to maintain a sense of balance in my life. I have gotten into a very bad cycle of pushing myself to the point of a breakdown, and then I participate in my favorite form of collapse which could be called a read-a-thon knit-cation. I have done this enough times to KNOW how long it takes for me to quilt something. 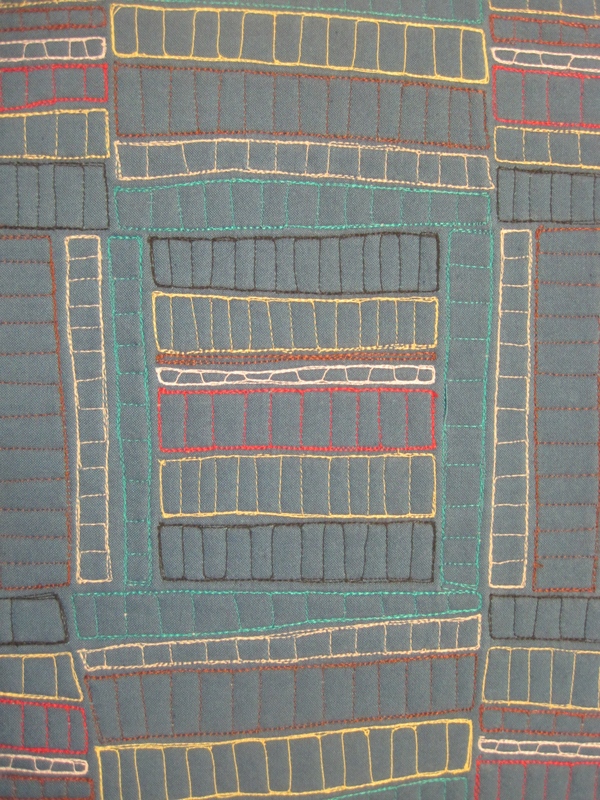 I can stitch a nine inch by nine square in a hour. That means a large piece–four feet by four feet–will take at least 25 hours behind the long arm. There is no going around these numbers. I can really only work four-six hours a day stitching before my body begins to protest. 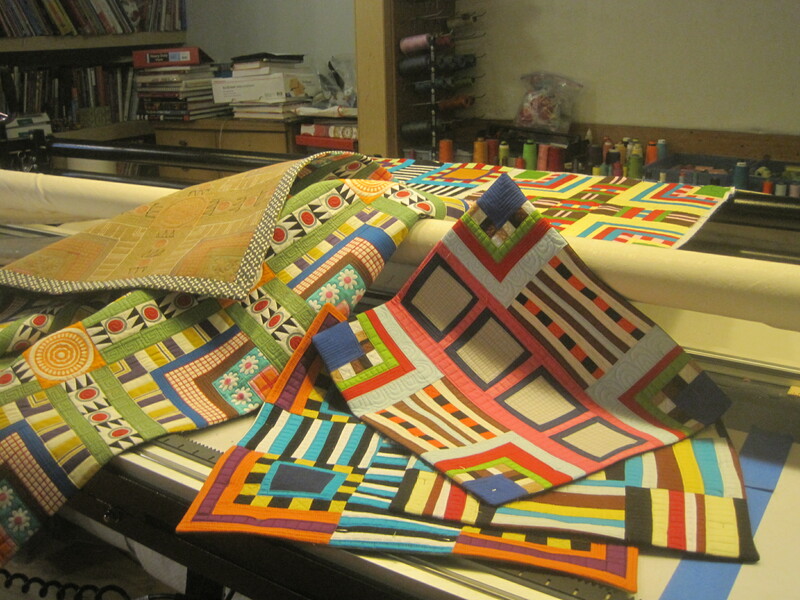 This means that four feet by four feet quilt is going to take at least five days. Still, my brain convinces my body that is is TOTALLY do-able in two days, maybe even one. With this last show, I did a better job of triaging than I have in the past. 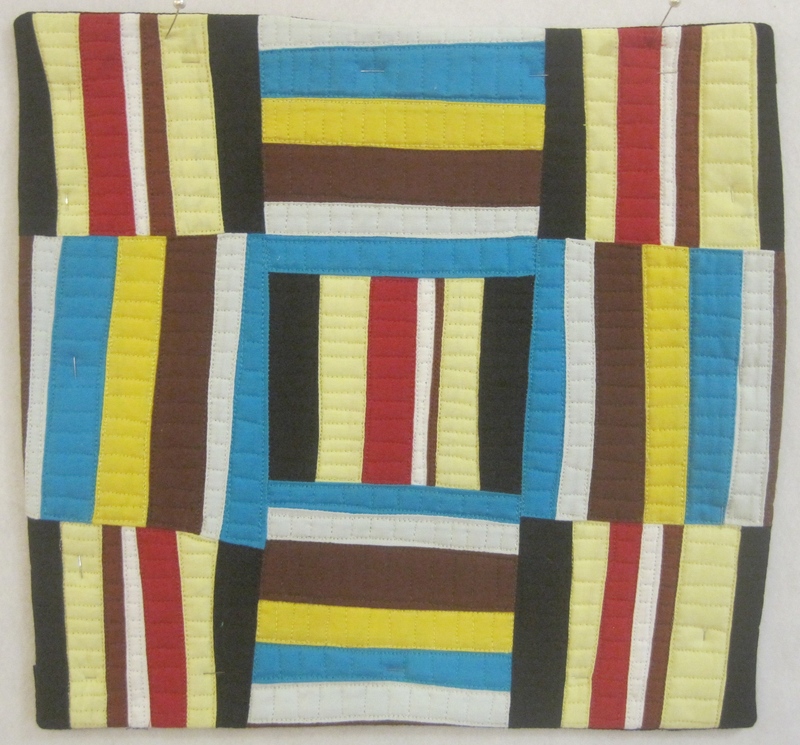 As the final days slipped away in a stitched fog, I managed to concede certain quilts–to let them go until next time. 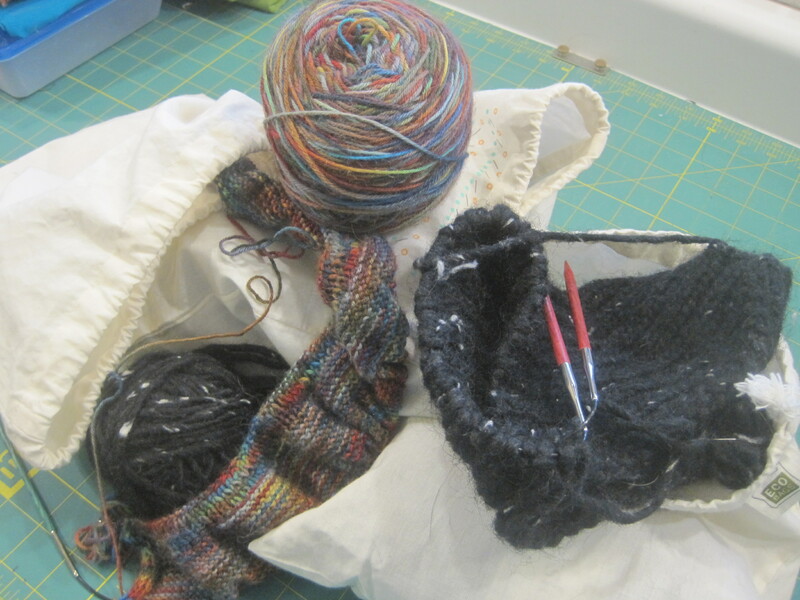 But then this week, I forced myself to rally, to ignore my body’s whimpering about its wounds, to stitch some more. I see and am surprised with the disconnect between my artistic aspirations and my body’s limits. A while back, I wrote a post about how I truly feel art should contain head-hands-and heart. (I hope you will take a moment to read it–it is one of my favorite posts.) But the head, with its ability to think in language, often bullies the heart and the hands with words, tells them what to do. I see this happening. I see this happening. Now, what to do? 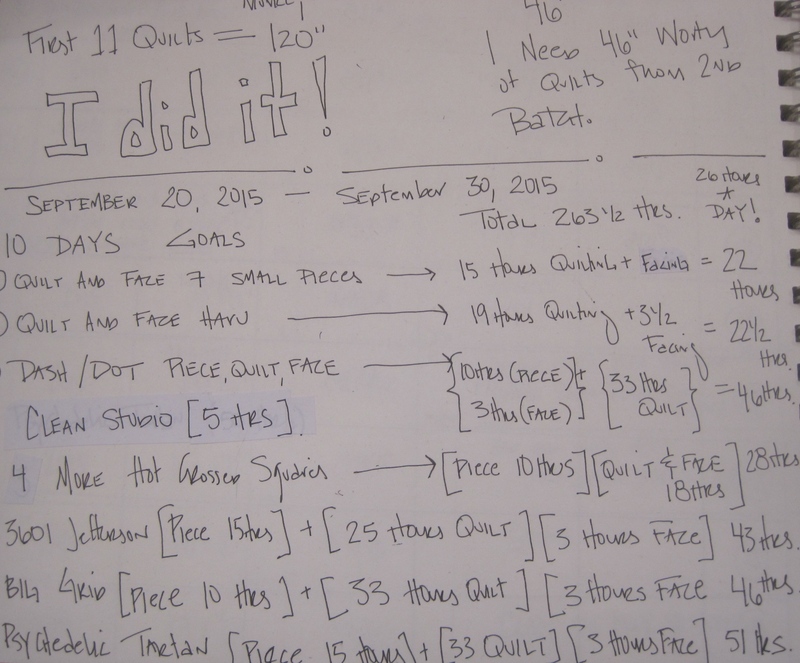 03 Oct	This entry was published on October 3, 2015 at 10:37 AM. 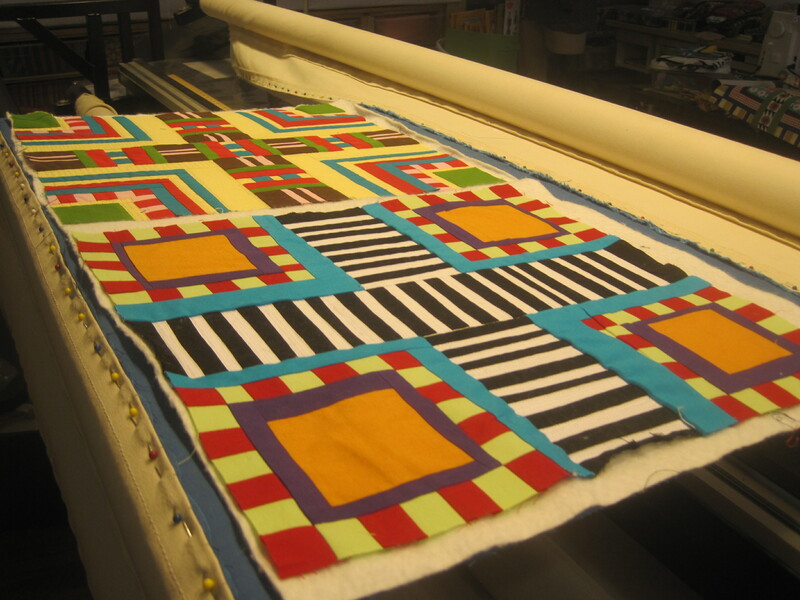 It’s filed under My Process-Quilts, Thoughts and Opinions and tagged Hot Crossed Squares, Long Arm Quilting. Bookmark the permalink. Follow any comments here with the RSS feed for this post. Regarding what the “brain thinks” vs what the “heart and hands” can do: Been there done that and I have never NEVER read a better description of the reality of this struggle thank you piece today. Your writing is wonderful. I only recently discovered your blog. 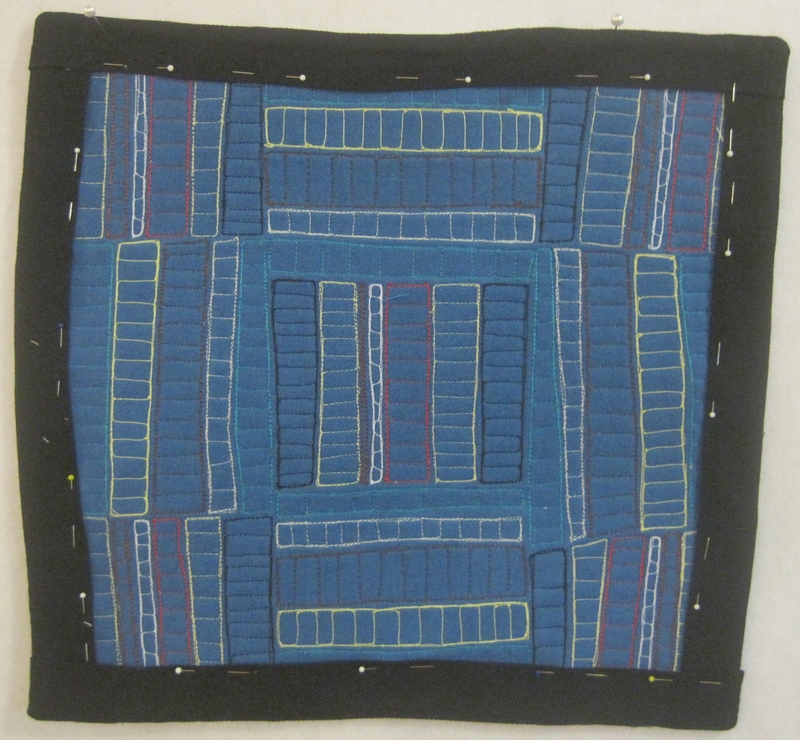 I quilted quite a lot 15 years ago, but have spent the last part of this lifetime in (mostly) seed beads and knit design. My beading projects, even when I average 5 or 6 hours a day in the studio, take months and months to complete… They are, some would say (my shrink, for one) obsessive, but they are my attempts to explain who I am, at least to myself. We all do seem to not be very good at taking care of our artist selves’ physical parts. Like eating right and actually sleeping in our beds, as opposed to falling asleep in the chair at the worktable. I have been to Anchorage a couple times and loved it. I would love to spend several months there to try capture the light there and the vastness in my work. Some day, right? In the meantime, I love love love your work – geometry is one of my favorite design tools, especially when I can combine it with random numbers and brownian motion and fluidity – all that science stuff. Rest. Breathe. Ok, back to work. Nan- I love your work and am very glad you stopped by and commented. First, to get you back to Alaska I want to share a link to an artist resdiency program we have in McCarthy Alaska. It is held at the Wrangell Mountains Center in downtown McCarthy I hope you will think about it.I do like to see a fiber person represented each year. It does come down to balance. And when I am not on a deadline, I am actually pretty good. I sleep enough, aspire to eat a plant based whole foods diet, hike all the time. But I struggle with getting close to the deadline and then think I should do MORE,MORE, MORE. And it spirals out of control. It is like all other aspects of my life something that will take practice. I am getting better, but no where near center where I should be. I knew when I wrote this blog post that I was admiting something about myself and my work ethic that was not pleasent to reveal, but in doing so I have gotten good feedback on was to move forward. Thank you for that. I would be very interested in the link about the McCarthy residency. When you get a minute. Enjoying reading the other responses to your blog. Some amazing people out there! Where will you be teaching (?) in Florida? Nan, we’re getting Maria to come teach at the South Florida Modern Quilt Guild. The class will probably be in Ft. Lauderdale. Definitely in early April. Are you anywhere near us? 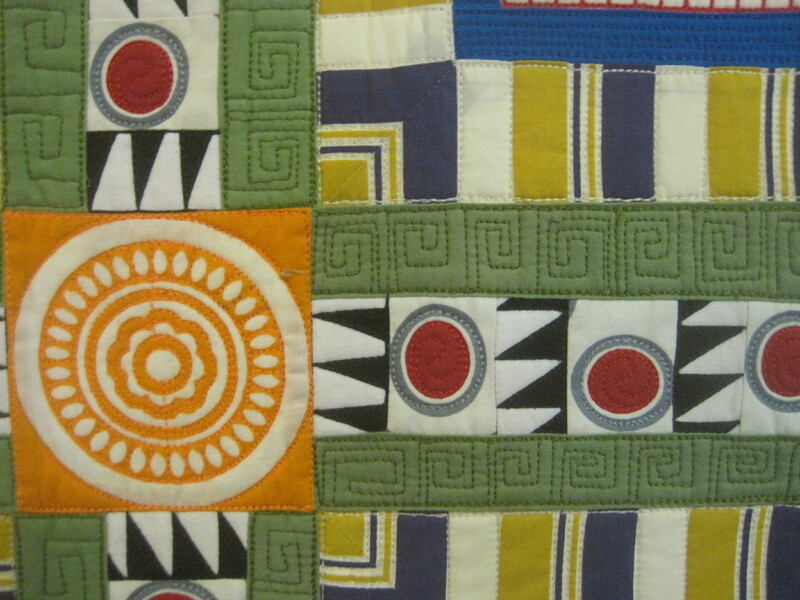 beautiful quilts, but ouch, very painful to get them done. just be careful pushing yourself too far. your body will make you pay and you could get to the point where it hurts so much to even do a reasonable amount of work. I know Tonya- It is the struggle I can’t seem to correct. But some how putting it out there in this blog is making it real, making me think honestly about how to move forward. I’m going to Florida to meet you! Isn’t that exciting? Tonya, I live about 100 miles northwest of Orlando. However, there is a slight possibility I could attend. It would take some finagling (not sure how you spell that) but when you can, send me any information, please. Meanwhile, I took a quick look at your delightful blog – love the cat. I was immediately struck by your use of words in your work. 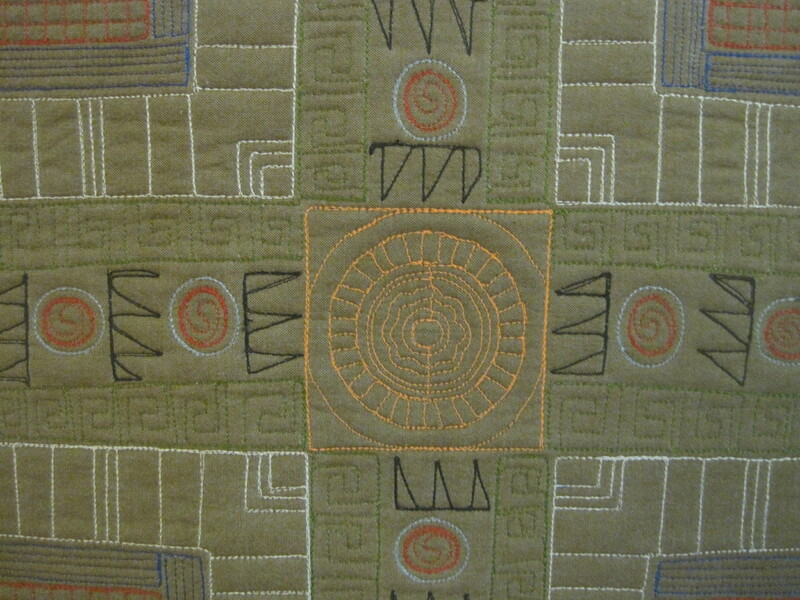 I use a lot of words in my beadwork; as a writer, it is a comfortable crossing of media. (Hey – it’s 430 am – hopefully you can follow this. 🌻) Anyway, please keep me posted and I will start thinking about it. Peace. Nan- It would be great to meet you in Florida! Tonya and I will keep you posted. But you achieved so much and gave much pleasure to others through your work. Thank you Sharon. That is very nice thing to say. It means ALOT to me. Maria — you have achieved a level of excellence that is going to continually put you in the (delightful) position of having more opportunities than time. You could, indeed, kill yourself by saying yes to everything, but there are other options. 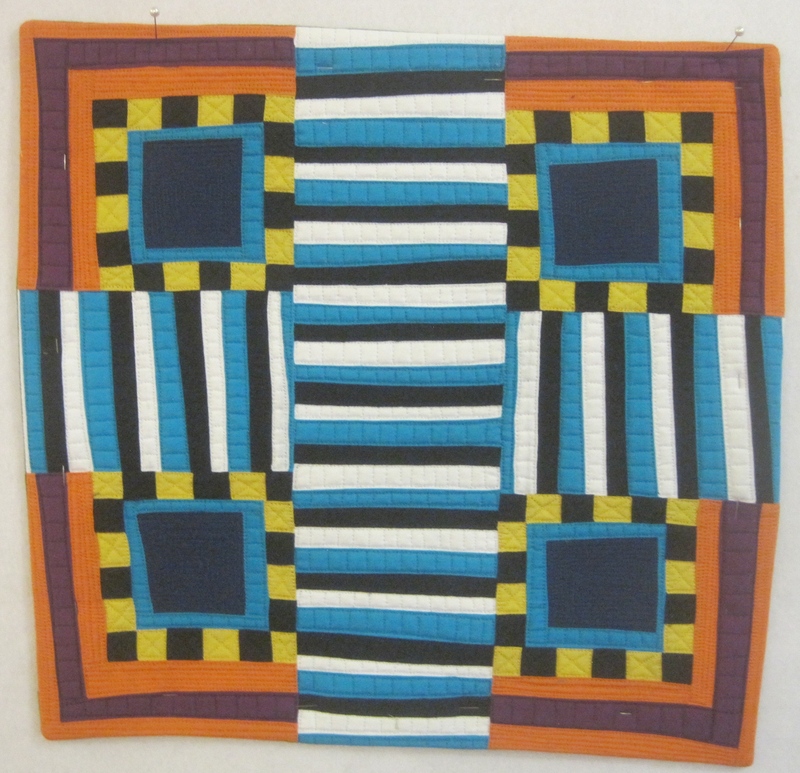 Some that come instantly to mind: don’t make all new work for a solo show but put some older quilts in too; get somebody else to help with the quilting or other tasks; or turn down an invitation because you’re too booked up. How to make these decisions? You need an overall business plan: a clear objective, a method of evaluating options, a regular self-assessment as to how you spent your time and how it paid off. So, for instance, you might decide that your objective is to be making $40,000 a year by 2020, and you will accomplish this primarily through writing and teaching, and that this year you need to cultivate teaching invitations for 2016 and 2017. 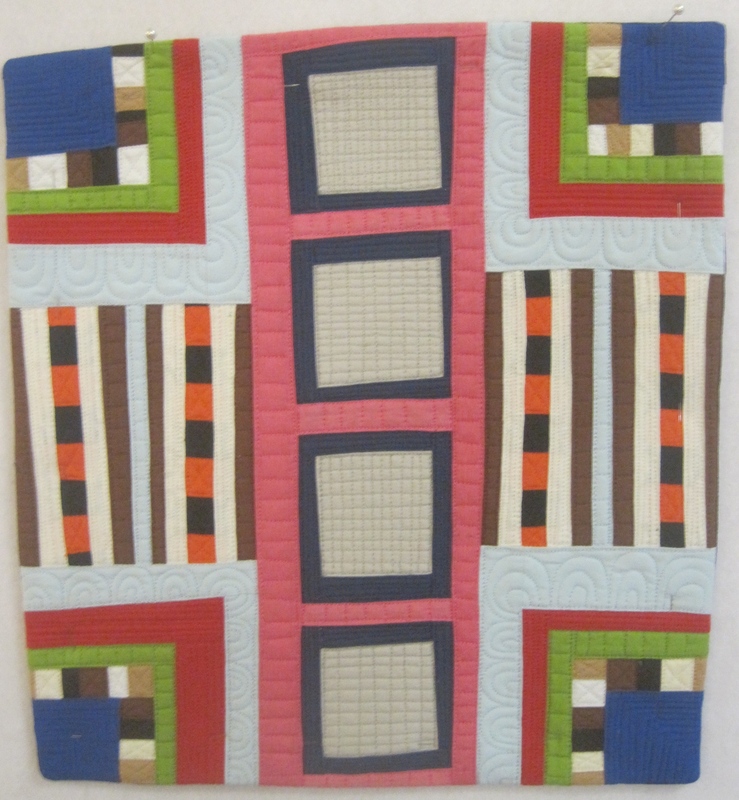 With this as your framework, maybe you say no to a solo show at a venue that is not close to an organized quilt guild because it is not likely to lead to a teaching gig. Perhaps you use a half-day of your knitting vacation to go back and think about what all you have done recently, and be honest with yourself about how each of the activities have gotten you closer to your objective. If you can determine that Show A was great because you sold three quilts and got to meet two people who you think will be helpful to you in the future, while Show B was a dud and it’s too bad you didn’t spend those two months doing something else, then it will help you know what to do when Show J looms on the horizon. Kathleen – Such excellent ways to evaluate the “business” side of the “art”. It makes so much sense!! Kathy- Thank you!I know you are completely right. Now just to stay on track. The glitter and glow of a solo show even if it is in remote Alaska is are very hard for me to say no too. Ilove that push, that excuse to make as much new work as I physically complete, but you are right. My business goals are very similar to what you stated. I have the goals defined, but I get distracted by having my name in lights. Thank you for putting it that way. 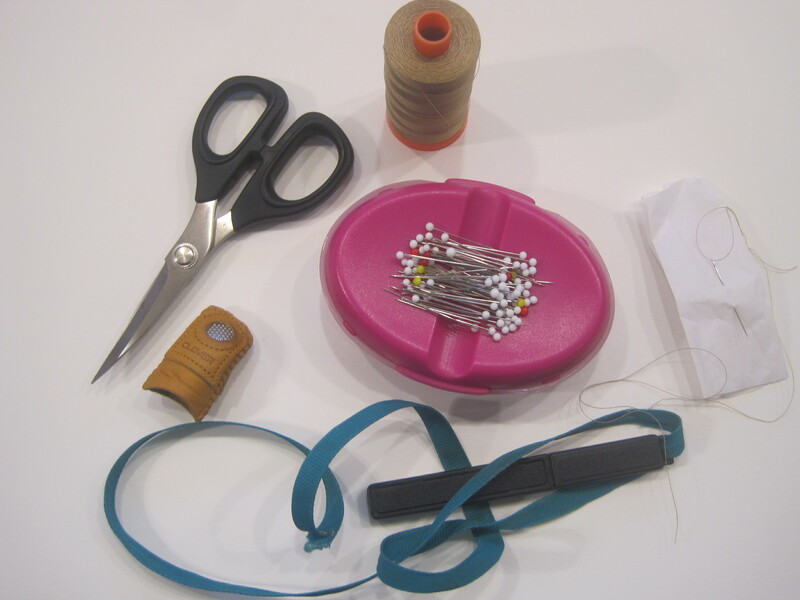 I will remember your words–print them out and put them next to my sewing machine! I really am honored you took the time to right them. Thank you. Oh Maria— we all do this, but not in such a grand way. I think Kathleen makes some excellent points. Are we creating for the joy of creating or for the deadline? Does the deadline allow for enough time? I self – impose deadlines; then get into what my hubby refers to as the ZONE and don’t come up for air for hours. Yesterday for example; he left before lunchtime to go off to his “train club”, for which I dutifully made him a sandwich for “later”. I at the same time, strolled out to the garage and upstairs to my sewing room….aka STUDIO (such an overstated name for my space). He returned home at 7:30 pm and I was still there. No break….and there is NO bathroom out there….so as he unloaded his car, I made the RUN for the house! Every time I wonder WHY ??? The fact is my focus is on what I was doing. As I cooked dinner at 8:00 pm (he is so understanding), I had to keep “sitting” because my back ached from bending and cutting and standing all day! Accomplishment? 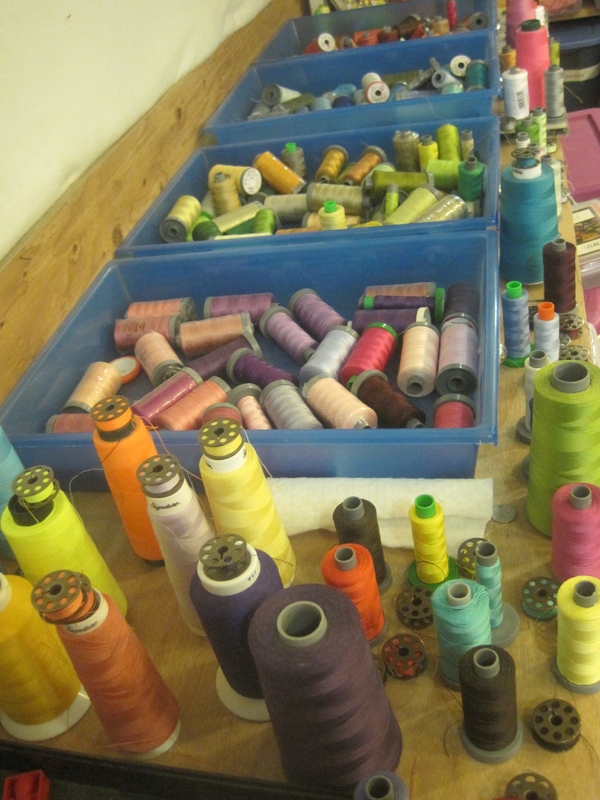 I was sorting, ironing, trimming and cutting for our Guild meeting on Monday for the “2nd time around shop” that I am newly in charge of! Not even a project for myself! And, no, I am not finished, and won’t be ever………it is a daunting project, but I know each piece of fabric I have handled over the last 10 days very well, and pray I can sell it all before the meeting begins on Monday morning at 10 am! Rest and revive with your book and knitting, a cup of tea or glass of wine. Mary- You are too funny. With your good writing, I can see that whole day play out. 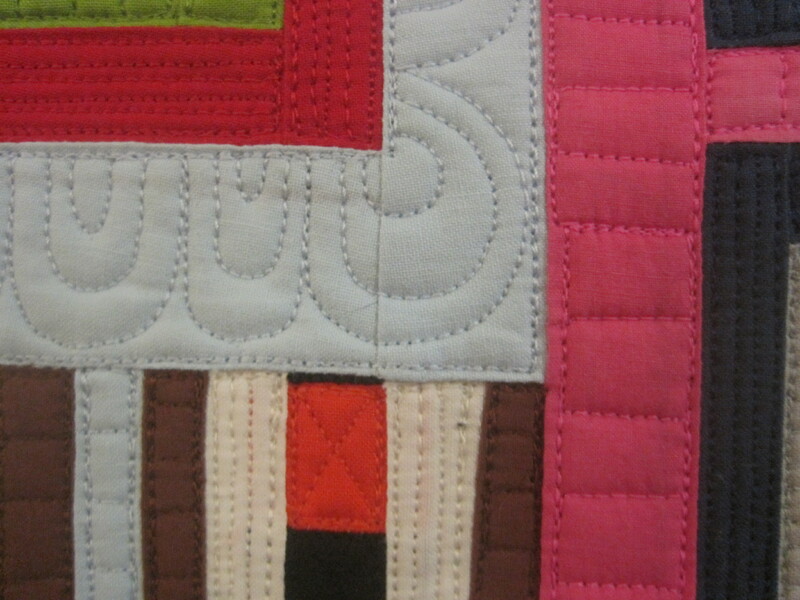 There is something about being in the quilting zone. And once you are there,you just don’t want to leave.Not even to use the bathroom! I am so looking forward to spending time with you and your guild! At 74 years old, I look back to how my body and mind have changed over the years and think part of your angst is that you do and must slow down a bit. You are not 20, have teenagers, husband, home to tend to and there must be some guilt involved here. Either you have trained your boys to be totally self reliant and fabulously helpful, husband too, OR feel you must have neglect on that count. In my opinion, the next generation of women,(yours), think they are super women and can do it all with excellence and ease. Something has to give physically, psychologically and emotionally. No harm doing your thing, but even that slows down with age. Give yourself some slack. Don’t take on so much now. Nurse Carole has been there. Not worth ending up taking psychotherapeutics in my opinion for that’s where you can be headed. Granted you are a very energetic person. 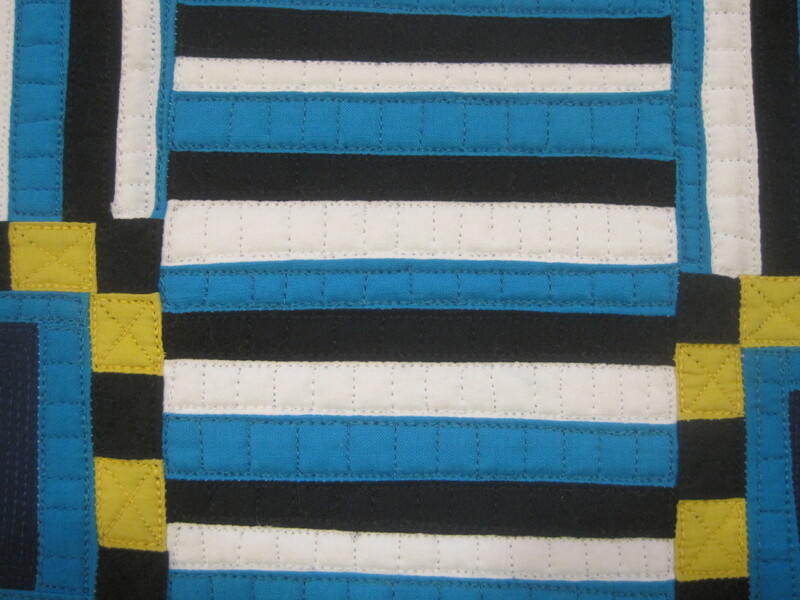 We all can see it in your blogs and fabulous quilts and garments but quality of both will suffer if you continue to attempt perfection and volume on all counts. Only YOU know the quantity of work you churn out but the quality of your creativity of a mother/wife, artist, writer, blogger, chef, teacher is more than any mortal can excel at. Few do and many suffer from the attempt. I speak from the head and heart I hope with no reservations and pray that my opinion can be taken with my true spirit as a friend and one who has seen many women that inadvertently heap medical treatment on themselves. Dark winter is coming to Alaska which can add to depression as well. Stay healthy. In the long run you will thank me for butting in. The wisdom of slowing a bit as we age is a good thing to gain. Your body is telling you what to do. You’re brave to bare your soul this way, and inspiring. Thank you Anne for commenting. You are so right. I feel that blog post helped me put it into perspective AND is helping me hear that voice. Maria! Thank you so much for writing this. Lately I have been on a kick of “what’s wrong with you?” “Why can’t you get as much accomplished as Maria?” Really, that’s what I’ve been thinking. Debby- Thank you SO much for sharing that story about Ghandi. I think slow and steady is best. I aspire to be slow and steady, but I am not there yet. In a weird way, writing that post has made me own up to my faults in this area and really try and make improvements. This post and the ensuing discussion is so good, so real. Thanks Maria and everyone. My kids are still too little to for me to zone out completely. They quite literally get in my face and break my concentration, but I can see that I could in future- easily – and ignore my body. Must remember this post in future. Lottie- I remember those days! And believe it or not that time of your life will quickly disappear and you will wonder what happened. I think the main point is balance. Yes. follow your passion, but yes, take the time to hike and enjoy your surroundings. It is just so hard to do, at least for me. Thank you for stopping by and commenting!